Do you need cleaning services for a biohazard or hoarding situation and don’t know where or how to start? We provide caring and compassionate biohazard and hoarding cleanup services while offering additional help for families. Biohazard, crime scene and hoarding cleanup projects require sensitivity and the utmost professionalism from the company you choose to hire. Dry Patrol has the compassion and expertise to restore any home to its prior condition. Dry Patrol often works with the family of the homeowner on hoarder cleanup projects. The hoarding tendencies of loved ones often comes as a shock to family members, and the Dry Patrol team understand the stress undertaking a project like this may bring to you. Because of this, we’ve developed a program to carefully walk you through the process of restoring a hoarded-home. Our hoarder clean up help is more than just a disposal service. Our hoarder cleaning experts will help you sort through your contents, to make sure we recover all items that every functioning household should have, plus all valuables, sentimental items, important documents, statements, bills and photographs. We will work by your side to make sure your residence is cleaned while not causing any additional stress, anxiety or frustration. During our initial phone call, we promise to listen. Each project is as unique as its homeowner, and we will make every effort to tailor our program to fit your specific needs. We’ll then craft an action plan that fits your schedule. Dry Patrol works with families across Ohio to clean, rebuild & restore homes. 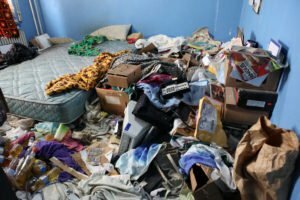 From moderate clutter to severe hoarding situations, we can help you through this. Contact our hoarding cleanup team today to learn more about how we can start the process of restoring not only your home but your life as well! If you have questions about hoarding cleanup, reach out to Dry Patrol. We can turn any home back into your dream home. If you are in need of hoarding cleanup services, contact us today! Trauma cleanup and biohazard emergencies require more than just cleanup and removal. They require sensitivity and understanding about the events that have taken place. Dry Patrol has the expertise and advanced equipment to thoroughly clean, disinfect, and deodorize your home. More importantly, we’re respectful of what you’re going through and serve as your liaison during the cleanup and insurance claims process so you can focus on taking care of your family. If you’re faced with trauma cleanup, call on Dry Patrol to help. We are specifically trained and equipped to thoroughly and safely handle trauma scene cleaning. Need Trauma or Crime Scene Cleanup in Powell OH? Our crime scene cleaners encounter a wide range of tragic circumstances and provide families with not just the expertise and equipment to clean up the scene, but an empathic ear of support and reassurance. Our crime scene cleanup experts in Powell specialize in trauma cleanup and the sanitizing of homes, businesses, and vehicles after homicides, suicides, murders, industrial accidents, and other traumas while demonstrating compassion toward those receiving services. our goal is to help families recover by relieving them of the burden of cleanup and return to them a home that is completely clean and sanitized. We completely sanitize the affected area with special cleaning agents and are able to remediate situations that typical cleaning services cannot. Crime scene cleanup can result in several health risks, so it’s best to have a professional handle the crime scene clean up process. As part of our crime scene cleaning services, we know incidents like this happen during odd hours, so we are available to you 24 hours a day, 7 days a week. We also know that crime scene clean up cost is the last thing on your mind during this time, so we bill directly to your insurance. There are many companies that clean up after a death, but only Dry Patrol will make sure you’re taken care of before, during, after the job is done. When handling drug lab cleanup, our goal is protect human health by assuring that properties formerly used in illegal drug manufacturing are properly evaluated, decontaminated, and are fit for re-occupancy. Meth lab cleanup specifically can be a challenge and should only be handled by a professional. If you come upon a lab or discover any chemicals that were improperly disposed of in Powell, do not touch anything! Call your local police department. Dead body cleanup is one of the most unfortunate jobs of all. We understand the last thing a friend, family or loved one wants to do is handle the death cleanup. Sometimes an unattended death can leave behind a great deal of blood and body fluids and other times it is relatively contained to a small area. Dry Patrol is equipped to handle any death scene cleanup. We will provide full and detailed death cleaning services, odor removal as needed, and remove any contaminated furniture and/or belongings. We will only speak to you and besides our team members unless we are legally obligated. We are dedicated to helping you get through this time and decreasing the responsibilities left to you. Death cleanup can be a traumatizing event no matter who you are. You have other things to worry about other than the cleanup of blood and other biological cleanups that may be required. We are forensic cleaners in Powell that will handle any suicide or murder scene cleanup needed. Our crime scene cleanup company, unlike a general cleaning team, possesses the tools and knowledge to remediate a scene thoroughly and safely. Our murder scene clean up crew is trained to handle many different kinds of cleanings as well as being respectful and sympathetic to you. For more information on homicide cleanup or general death clean up services, give Dry Patrol a call today at 740-417-9006. 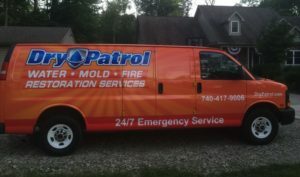 If you’re experiencing a Powell biohazard emergency and need an aftermath cleaning, reach out to Dry Patrol for help restoring your home’s beauty and safety, coordinating insurance (no matter who you work with), and getting back to normal life. 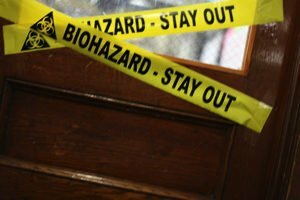 We are a Powell biohazard remediation company and are deemed the ideal decision by Law enforcement, families, and homeowners who are in need of biohazard crime scene clean up. Contact us today for all your biohazard removal. We provide biohazard cleanup and hoarding cleanup services to Powell OH in 43209. Powell was first settled around 1801, two years before Ohio became a state. It was named “Middlebury” at the time, because the first settlers came from a town of the same name. In 1857, Judge Thomas Powell established the first post office in the community, and the residents decided to adopt his name. The town of Powell had its start in the building of the railroad through that territory. Powell was finally incorporated as a municipality in 1947. Today, Powell is home to places such as Library Park.